Lewandowsky’s recent article, “Role of Conspiracist Ideation” continues Lewandowsky’s pontification on populations of 2, 1 and zero. For example, whereas coherence is a hallmark of most scientific theories, the simultaneous belief in mutually contradictory theories—e.g., that Princess Diana was murdered but faked her own death—is a notable aspect of conspiracist ideation . However, this example is hardly an anomaly. The most cursory examination of L13 data shows other equally absurd examples. The correlations confirm that rejection of scientific propositions is often accompanied by endorsement of scientific conspiracies pertinent to the proposition being rejected. However, as with the fake Diana claims, Lewandowsky’s assertions are totally unsupported by his own data. In the Role survey (1101 respondents), there were 53 who purported to disagree with the proposition that HIV caused AIDS (a vastly higher proportion than in the climate blog survey – a point that I will discuss separately). Of these 53 respondents, only two (3.8% of the 53 and 0.2% of the total) also purported to believe the proposition that the government caused AIDS. It is therefore simply untrue for Lewandowsky to assert, based on this data, that denial of the link between HIV and AIDS was either “frequently” or “often” accompanied by belief in the government AIDS conspiracy. It would be more accurate to say that it was “seldom” accompanied by such belief. Although Lewandowsky did not mention this, both of the two respondents who purported to believe this unlikely juxtaposition also believed that CO2 had caused serious negative damage over the past 50 years. However, Lewandowsky’s false claim received even less support in the survey of stridently anti-skeptic Planet 3.0 blogs. Even with fraudulent responses, only 16 of 1145 (1.4%) purported to disagree with the proposition that HIV caused AIDS, and of these 16, only 2 (12.5%) also purported to endorse the CYAIDS conspiracy. These two respondents were the two respondents who implausibly purported to believe in every fanciful conspiracy. Even Tom Curtis of SKS argued that these responses were fraudulent. Without these two fraudulent responses, the real proportion in the blog survey is 0. Either way, the data contradicts Lewandowsky’s assertion that disagreement with the HIV-AIDS proposition is “often” or “frequently” accompanied by belief in the government AIDS conspiracy at the climate blogs surveyed by Lewandowsky. 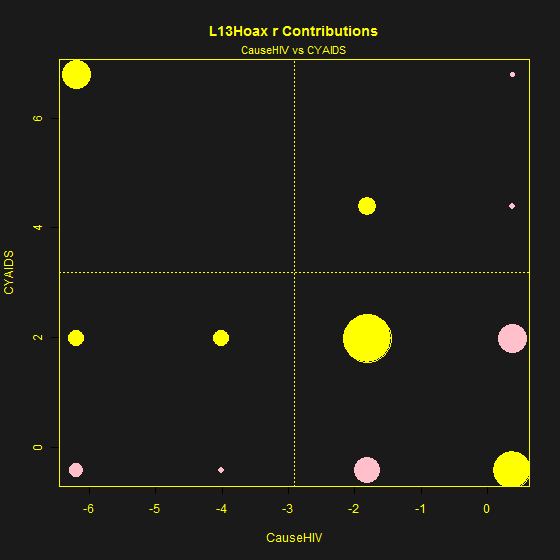 Even though there were even fewer respondents supposedly subscribing to the unlikely propositions in the blog survey, the negative correlation between CYAIDS and CauseHIV propositions was even more extreme: a seemingly significant -0.31, though only the two fake respondents purported to hold the two unlikely propositions. Update: I’ve added some plots below to illustrate how Lewandowsky’s calculations of correlation go awry. 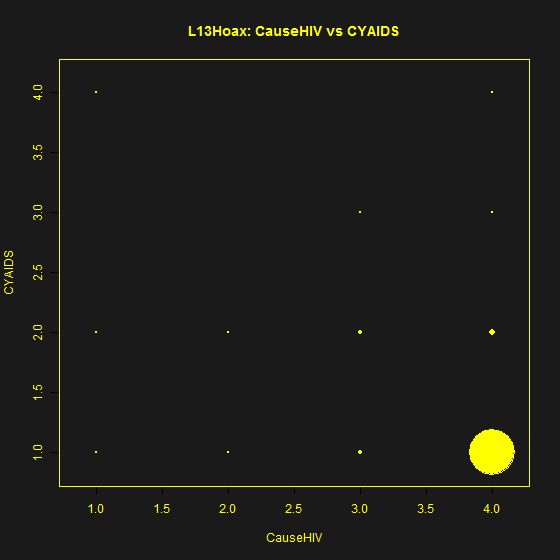 The contingency table of CauseHIV and CYAIDS for the L13Hoax data is shown below, with the size of each circle proportional to the count in the contingency table. Most of the responses are identical – thus the large circle. Because there are only two respondents purporting to hold the two most unlikely views, this is a very faint dot. A correlation coefficient implies a linear fit and normality of residuals: visually this is obviously not the case. There are a variety of tests that could be applied and the supposed Lewandowsky correlation will fail all of them. If one goes back to the underlying definition of a correlation coefficent, it is a dot-product of two vectors. In the context of a contingency table, this means that the contribution of each square in the contingency table to the correlation can be separately identified. I’ve done this in the graphic shown below, since the points, while elementary, are not immediately intuitive in these small-population situations. For each square in the contingency table, I’ve calculated the dot-product contribution and multiplied it by the count in the square, thereby giving the contribution to the correlation coefficient (which is the sum of the dot-product contributions.) The area of each circle shows the contribution to the correlation coefficient: pink shows a negative contribution. There are a few interesting points to observe. In a setup where nearly all the responses are identical and at one extreme, these responses make a positive contribution to the correlation coefficient. Responses in which the respondent strongly disagrees with CYAIDS but only agrees with CauseHIV or in which the respondent strongly agrees with CauseHIV but only disagrees with CYAIDS make a negative contribution to the correlation. Respondents with simple agreement with CauseHIV and simple disagreement with CYAIDS make a strong contribution to the correlation coefficient. The two (fake) respondents make a very large contribution to the correlation coefficent despite only being two responses. This entry was written by Stephen McIntyre, posted on Nov 13, 2013 at 12:46 AM, filed under Uncategorized and tagged Diana, lewandowsky, role, wood. Bookmark the permalink. Follow any comments here with the RSS feed for this post. Both comments and trackbacks are currently closed. Kidding (somewhat) aside, the more I see of Lewandowsky’s “work”, the more I worry about the future of our planet’s stock of academics. Perhaps history will one day record that Mann represented the nadir of mediocrity; and once this “tipping point” had been reached, it’s been downhill all the way for those who have tied their sails to his mast and/or puck to his hockey-stick! How can you go downhill from a nadir, especially if you’re on a boat or an ice rink? This was indeed hard until populations of zero were shown by Dr Lewandowsky to prove both a proposition and (by the same logic) its opposite. After that no hill, however steep, either up or down, could be an obstacle or even a hill. Going downhill from a nadir just requires application of the Tiljander correction. A frabjous point, my beamish boy. It would seem at first sight that reasoning from populations of zero (or, if one is data-rich, two whole respondents) is a hallmark of Lewandowsky. The real hallmark, history will record, is demonisation of the mentally ill to smear his opponents. In the UK there is currently a high-profile campaign against stigmatisation of mental illness, with Tony Blair’s former director of communication, Alastair Campbell, who has been candid about his own battles with alcoholism and depression (something said to have forged a close personal link with George W Bush), playing a leading role. It came to mind as I wrote the first paragraph and wondered at the lack of compassion in Lewandowsky. Two strands in our culture so at odds. To be clear, I’m not pleading insanity and thus diminished responsibility for being a long-time supporter of Steve McIntyre’s highly rational critiques of climate science. But I wonder if there could be something self-correcting not just in science but in society. Those of good heart must make the connection. No surprise one thing that made Lewandowsky work look total rubbish from the start was the frequency of true AGW believers who also were 9/11 truthers and are more than willing to see the CIA in ever bad act. Given their are those that find tin-foil and good hat material on both sides , the idea that AGW proponents were all pro-science is total undermined by their views on GM and nuclear when science is throw out of the window in favour of scare. “In the history of science, we are not aware of a case in which a serious scientific issue was adjudicated by tabloid journalists or their modern-day equivalents such as blog commenters”. Irrespective of the historical accuracy of this assertion, there is a high probability that it has been shown wrong by this very blog by commenter Steve McIntyre. To avoid disproof of this assertion, it is simply required of Lewandowsky to show that commenter McIntyre got it wrong. On this point, I recommend “The Book Nobody Read: Chasing the Revolutions of Nicholas Copernicus” by Owen Gingerich. The title is ironic, a quote from an earlier academic who mistakenly thought that although everyone wanted a copy of De Revolutionibus for his library, nobody actually read it all the way through. Gingerich shows that, in fact, a large proportion of the existing 1st and 2nd edition copies of the book were heavily annotated by people who decided to work through all of Copernicus’ calculations in the margins. Many of them were not full time scientists or academics and some of them contributed to the evolving understanding of the solar system through their commenary. I would say those folks who got their hands on the calculations and worked it all the way through, checking and sometimes criticizing the calculations in the margins, then sharing their copy with others, are the modern day equivalents of the best blog commenters. A few bits: A typo? Wasn’t it 1001 respondents? Be careful with the reversed statements (marked with R). These are mis-reported in the figures and have the agree-disagree scale around the wrong way – you can tell by cross-tabbing answers from the datafile and checking for consistency. The age question wasn’t properly screened or cleaned. It’s not a big issue, but it is an easy and obvious check you’d expect to be done. This leads on to the point that a national representative sample of individuals must by definition include people with a huge variety of backgrounds and educational abilities. Long and strange/boring attitude batteries will have a level of ‘mis-punching’ – both accidental and wilful – particularly if you can’t select Don’t know. In addition, complex and multi-part statements may be misread by people with lower than high-school level reading comprehension, or people completing the survey too quickly. CNatFluc (which is reversed) seems to have people not picking up the ‘just’ in the wording. For this reason, a level of ‘human-failing’ error has to be taken into consideration in the results and not just statistical error – this can be quite high, particularly on self-complete online surveys. It was also strange to report variable constructs, and then look for SEM relationships without looking for groups classified under the generated constructs. My reason for looking through the data was to establish how many people had each viewpoint. It felt like the work was done without ever running a cross-tab. Steve: I agree 100% that the “work” seems to have been done without elementary cross-tabs. The SEM techniques used by Lewandowsky seem to be popular and deeply embedded in psychology. It would be interesting to see a thorough discussion of these methods by real statisticians – in particular, discussion of their calculations of “statistical significance”. There must be some practising climatologists out there that are prepared to call out these charlatans and hangers-on, if only to maintain some shred of credibility for their field. OTOH it may be a lot less cringeworthy for them to drop the tag of climatologist altogether. Classic Catch22 for them I suppose. Lewandowsky and pals may have inadvertently stumbled upon a new branch of psychology. Maybe call it Quantum Psychology (QP), with a concomitant uncertainty principle that allows zero point fluctuations in sub-populations that have a classical count of zero. The correlations Lewandowsky reports could be likened to virtual particles. Attempts to observe these virtual populations influences the population count and/or the phase of the belief being measured. Reconciling QP with Classical Psychology will require decades of research grants. SEM originated in economics, but as far as I can tell it’s been most widely adopted in psychology/sociology and other softer “sciences”. The psychology association originally biased me against it, but while it may be misunderstood and abused in that field, it’s statistically legitimate as far as I can tell. While it does have a reasonable statistical foundation, it also takes a lot more due diligence than many methods and it also likes large sample sizes. It also makes much stronger assumptions than most methods about correlations and what you do and don’t include in your model. It features more goodness-of-fit measures than you can shake a stick at, none of which are superior to the others, and it is more of a confirmative/comparative tool than most. That’s my take on it, anyhow. Of course, Lew is pretty much using a tool that he doesn’t understand but which he uses to confirm his biases. SEM is more flexible than most in that regard, but if used properly it seems to be a powerful tool. I wouldn’t focus too much on SEM itself but rather on Lew’s incompetent/improper use of it. I see what it is doing. However, in my experiments with the method – I’ve been using the R-package lavan which seems more stable than the R-package sem – it seems possible to achieve “statistical significance” with a variety of different models. So when Lew makes statements about statistical significance using one model, that doesn’t preclude achieving statistical significance with another somewhat contradictory model. Plus the documentation that I’ve seen presumes normality. Do these assumptions extend to circumstances where one is examining relationship between hypotheses in which there are only a few outliers? Seems to me that one cannot assume this, but it has to be demonstrated. Yes, I prefer R’s lava an as well. Much nicer notation. I believe the “many models statistically significant” is part and parcel of SEM CFA. You’re supposed to use various goodness-of-fit measures and tests to compare among statistically significant models to find the best. It’s flexible enough that you can reverse arrows and still get the same results. Lavaan and others are TSLS/covariance approaches. If it makes better sense to you there are also PLS (partial least squares) methods in R libraries like semPLS, plspm, pls, etc, which evidently work better in large-scale applications. Steve, (univariate or multivariate) non-normality can definitely affect SEM results. Parameter estimation can be affected, and verification statistics likely will be. The extent of the effect of non-normality depends on a variety of factors, and it is mitigated by a large (500+) sample size, but it is never something that can be ruled out a priori. That’s why one of the first steps in any guide to using SEM is to check for normality. It’s also common to modify a data set by doing things to increase normality. The most relevant example being the deletion of outliers (though one should always be careful to test the effect of such modifications). Steve: the problem with the Hoax dataset is that term “non-normality” doesn’t do full justice to things like CYMoon, CYAIDS,… where the vast majority of respondents strongly disagreed and there were only a few dissenters, some of whom were fraudulent. I agree “non-normality” doesn’t do the data set justice. I’m not sure SEM can be sensibly applied to it, even if you transformed the data to make it more normal and deleted outliers (or used bootstrapping to try to account for them). The only thing I’m sure of is the results would be dramatically different if you did. Lewandowsky et al failed to do any of the simplest checking necessary to justify SEM. In doing so, they ignored problems which indisputably affected their results. Anyone with any meaningful experience using SEM would know better than to do what they did. It may be justifiable to use SEM for this data set, but it is not possible to justify how Lewandowsky et al used it. The first lecture in my 1960s statistics class started with “First, establish your distribution”. Soon after, we touched on ways like logs to transform non-normal to pseudo-normal for ease of work. Plus associated known dangers. I guess that’s all become non-trendy in this post-normal age. Lew’s pioneering work in the statistical treatment of small populations traces its roots to one of his earliest papers: “The Role of Pre-existing Attitudes in the Denial of Self Regeneration”, Quarterly Journal of Statistical Psychology, 66, 1493 – 1503. Of course you are assuming a whole-number value. My comment here (the second, just after Hilary Ostrov’s) has disappeared, though Geoff Sherrington’s comment referencing mine (currently the eleventh) is still there. I realise that this blog is essentially devoted to the statistical analysis of certain scientific propositions, but tolerates comments which advance the discussion in some way. For that reason, I avoid comments on the statistics, and try to limit my interventions to information on developments of the argument elsewhere. There are many issues with Lewandowsky’s “Role” paper, of which Steve’s statistical analysis is just one. I referred to others dealt with in comments on Lewandowsky’s own blog. Steve made a comment the other day on my blog. I would like to assure him that it will remain there. Steve: I don’t recall any issue with your comment. DUnno what happened. Suppose I surveyed 100 liberals, asking their views on various issues as well as how conservative/liberal they are. Naturally, I would find correlations. Under your methodology, I could take those correlations and declare they prove things about what conservatives believe. The fact I surveyed no conservatives would be irrelevant to your methodology. The fact my data has absolutely no information about conservative views wouldn’t matter – I’d still be able to conclude things about conservatives’ beliefs. There is no limit to this. Your methodology would allow us to “prove” any negative characteristic exists for any group. There is no way to justify it. One doesn’t need a technical explanation. It’s obvious a methodology is nonsensical if it can prove things about groups no information exists for. That said, I can provide a technical explanation for why this happens if you’d like. Steve: remember how Gavin Schmidt, William Connolley etc pretended to be “unable” to understand upside-down Tiljander. I’m sure that Wood will be even more defensive. Over the years, I’ve tried to stay away from criticizing young scientists. Lewandowsky’s use of this stuff is worse than Wood’s error. If I survey a large group of liberals and they all give the same response regarding slavery, the correlation between political orientation and slavery would be impossible to compute because there is no variation in either variable. If we instead gave that group of liberals a left-right political orientation scale on which they placed themselves, and there was some variation in that variable but not in the slavery variable, we would get the same result. You can’t compute a correlation coefficient in the absence of variation – this is very basic statistical knowledge. While it is true “this is very basic statistical knowledge,” it seems to be a case of willfully misunderstanding my point. First, my example specifically referred to asking after “views on various issues” and “how conservative/liberal” the respondents are. Wood suggested if “we instead gave that group of liberals a left-right political orientation scale…” The scale he suggests be given “instead” is practically identical to the scale I listed in my example. I find it incredibly difficult to see how he could misunderstand my point such. Though I appreciate the effort to demonstrate your point, I’m not having trouble understanding what you’re saying. I just disagree with the premise. Moreover, the examples that you’ve provided here don’t make mathematical sense. I never expected anything to come from this exchange, but I expected better than this. Oops. I didn’t realize signing into WordPress to use one’s blog would mean I’d have that account signed to my comments at other blogs. Oh well. Live and learn. 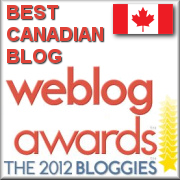 For the record, I’m not planning on taking up blogging. I tossed that up because I got tired of having to do internet searches for things I’d written, and I figured I could use that as an easy resource. Good work, Brandon. He doesn’t have anything of substance to refute your central point. As I have said at Judy Curry’s, so much of this “research” is like a mountain goat leaping from crag to crag, without even a downward glance, let alone acknowledging what lies in between. Thanks johanna. By the way, I’m actually being generous to Michael Wood. It is not unheard of for yes/no questions to be asked with a scaled set of responses. You can have categories like, “Definitely,” “I think so,” “I don’t know, “I don’t think so” and “Definitely not.” I’ve taken a number of surveys like that. As such, my questions weren’t even wrong. But it’s like Steve McIntyre has observed elsewhere – People defending work will often take anything they can portray as error as proof your criticisms are wrong. It doesn’t matter if you make an error or not. It doesn’t matter if the (supposed) error affects your argument or not. Unless you write without including anything that could possibly be taken as mistaken, they can misunderstand and misrepresent your arguments. Of course, if you did miraculously write your case perfectly, they could just ignore you, or as seen above, simply ignore what you write and respond to fabrications. Steve: yup. you’re 100% right on their argument technique. I await with lively anticipation Mr. McIntyre’s take on the risible new RC posting: “Global Warming Since 1997 Underestimated by Half”, based in part on research conducted by a Canadian who is not an established climate scientist. This Canadian the choir chooses to believe, with the notable exception of Ray Ladbury. Nothing to do with the favourable outcome, of course, and thank the heavens there has been no hiatus after all! Re: mertoniannorm (Nov 13 21:48), That study is clearly worth a Lew-en-dorsement! It has all the required features — including data derived from …. nothing… zero sum, ergo sum. So the missing “heat” is not in the ocean depths after all. Thank goodness a more robust climate science analysis has put that furphy to the sword. Or has it? Sorry to be off topic but I just noticed James Annan is out of a job and headed back to the UK (see http://julesandjames.blogspot.sg/2013/11/so-long-and-thanks-for-all-sushi.html ). I’ll miss his photos of Japan. True; absurdity in a Lewandowsky offering is no anomaly. begs the question of whether there is such a thing as “positive damage.” There is also the ever popular “negative impact,” another commonplace in enviro-speak. It leaves one wondering if a “negative impact” leaves a dent, while a “positive impact” might raise a lump. did my comment about Lewandowsky’s ‘Misinformation and Its Correction’ paper, drop into the spam? And to think that Bristol University and the Royal Society thought this guy was such a star that they headhunted him and gave him a pay rise. Very depressing. Based on Wayne’s explanation of the SEM methodology, it reminds me a bit of the debate about the use of kriging to fill in data between temperature stations. Practising geologists who have used it in fields like mineral exploration say that there are caveats on using it; that other methods should be deployed as well wherever possible for verification; and that even then, you don’t really know the truth until you dig a hole. Hence, they have reservations about the way some climate scientists use the technique when applied to infilling temperature data. It sounds as though SEM, even if used correctly, is subject to similar caveats. Johanna, this is the problem with the whole debate, that a dwarf intellect can be feted as a great scientific mind sis common in this “debate”. Take Michael Mann, anyone with any dignity in the same field would have publically ditched him years ago, or Peter Gleick, Failed Soothsayer in Chief made a Fellow of the Royal Society. It stinks. geronimo, I suspect that you mean Paul Ehrlich, not Peter Gleick. But yes, the RS really hit rock bottom when they anointed him. He’s not just a charlatan, he’s an openly failed charlatan. Very sad for anyone who cares about science and integrity. http://www.psychologicalscience.org/index.php/publications/journals/pspi/misinformation1.html . This work stresses the role of social media and social networking in transmitting misinformation, and that ‘Individuals pre-existing attitudes and worldviews can influence how they respond to certain types of information’, which includes how they then filter further information. So far so good. Yet you’d surely think this might alert him to memetic influences, and indeed the paper references urban myths, which are essentially trivial memes. But apparently not. I believe the problem here is the definition of ‘information’ and ‘misinformation’. If (as it appears from the work), the primary definition of *genuine* information is that it comes from ‘a credible source’, i.e. authority, then further analysis will be blind to the largest memeplexes, which typically *are* authority. While the paper addresses ‘multiple authoritative sources’, ‘correction of inadvertent misinformation from authority’, ‘coherence’, and various other angles, a major memeplex will, spiderlike, have very many sources at its service, so also providing a sense of coherence, and the information it disseminates is not wrong inadvertently, nor necessarily wrong at all, but is in service to replication and not to truth. A further problem here as with psychology in general (or rather what little of it I have seen in relation to climate issues) is that while the effects of cultural immersion are certainly acknowledged, e.g. in the [Lewandowski] quote above, it appears to be the case that CAGW is *not* viewed as a culture in and of itself, even though other narrative replicators (religions or dogmatic political systems) are, with various conservative memes particularly being quoted as an ‘impediment to action’. CAGW is mistakenly viewed as ‘pure science’, and ultimately it would appear that Lewandowsky has not looked inward and seen the effect his own paper describes. This guy tries to treat a population of skeptics, each with different sets of knowledge and opinions, as one being, accusing it of being internally conflicted and incoherent. However, alarmists have different sets of knowledge and opinions, and, if viewed as one being, would be internally conflicted and incoherent, too. 2 minuses make a plus. so he correctly states that CO² has had a +ve effect. Careful. The models probably assume only normality of the errors, not of the data. For posterity’s sake, I’d like to post an update regarding the absurdity of Lewandowsky (and Wood’s) methodology. I recently did a survey (which amazingly got over 5,000 responses) so I could apply their methodology. Today I posted some results from it. The title of the post is, Warmists Are Never Wrong, Even When Supporting Genocide. That’s right. Using methodology popularly supported by global warming proponents, I have managed to “prove” global warming proponents support genocide and believe they are never wrong. Just think. This is the quality of work people get paid to do.